Walter has written a well-balanced, authentic account of his time, 40 years ago, in the Kingdom of Bunyoro-Kitara, one of Uganda's 12 Districts. 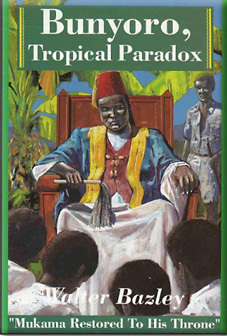 It is a compulsive read, and timely, since Solomon, son of the old Mukama, Sir Tito Winyi, who died some years ago, and whom Walter served, was last month installed, as his father had wished, as the 27th ceremonial head of this ancient Kingdom, having triumphed over John Rukidi, his brother. Was Walter fair to write down his DC, Cecil Amory, and himself up? Harrow, tempered by Toronto, and then fed by five years RNVR, may explain his sense of superiority, and of being born to govern, and the qualities sought by Sir Ralph Furse which Walter displays. He was well-organised with a mind of his own - not a Secretariat man, although he writes well. He had a passion for hunting from his early family experience which today would seem excessive (55 guinea fowl and two francolin in one paragraph on page 196). He learned from Stephen, his invaluable interpreter, that he had a Bunyoro nickname which translated as 'the sharp-eyed hunter', but he does not mention that he was known to his Admin, colleagues as 'blood-bath Bazley'. Forty years ago Europeans were licensed to kill and Africans poached (on their own land it must be said). Today unfashionable slaughter is decimating Africa's game. Stephen's power and influence was considerable and, partly because of our limited language skills, he was a crucial intermediary on safari and in the office. Such men were often our successors and benefited from their long apprenticeship. Chapter Three captures the fresh excitement and the fascination of his first safari. It is closely observed. He reveals how Uganda was indirectly administered in sharp contrast with the then Congo, which he visited after crossing Lake Albert to discuss fish-marketing with his opposite number. Today as Rwanda tears itself apart we can see the faults of our various imperial systems. Uganda later suffered grievously from Andrew Cohen's deportation of the Kabaka and his Fabian U-tum away from indirect rule in pursuit of a doctrinaire Westminster model. Walter recognised the value of the Devonshire Course, but he remained the devoted practitioner of colonial development and has little to say, even with hindsight, about the grand Imperial design of which he was part. Does he have views on what went wrong in Uganda? And how did he manage to miss out on John Beattie, ex-Colonial Admin, and a contemporary whose work was the major study of the Bunyoro? That Walter had style is apparent. We were poorly paid. Private means were important. He drove an American box-body, shot with his two Rigby-Mausers and his father's Boss & Co. 12 bore. He had a well-stocked pantry with bulk stores. He entertained well. He exchanged gifts when on tour, rather like an early explorer except that he gave presents of Heinz ketchup and literacy primers for the peasants' gifts of fruit, vegetables, chickens and eggs. This is a good read and an accurate picture. I have not, and will not, nit-pick over errors and points of detail, but cannot help observing that his vignette at p.233 about an officer having been rebuked on being discovered in the office wearing green trousers and a flowered shirt is incomplete. What upset John Willie Steil, who was Secretary for African Affairs, was my 'yellow sweater', and the fact that as he crossed into Masaka District, a rinderpest area, the guards removed the ham from his sandwiches under our order preventing the movement of meat, so he was looking for trouble when he arrived at headquarters. Old Africa hands will be nostalgic about this honest account of a Colonial who cared. Scholars will get a glimpse of what really happened on the ground.